The exhibition of artworks by Katsiaryna Sumarava “Subjective Landscape” will be on display at the Museum of contemporary art in Minsk, Belarus from April, 14 through April, 26. When you take a look at Katsiaryna Sumarava's colorful works for the first time, you feel touched and moved by the visual power and emotional expression of such bright images. Sensitive use of color is one of the dominant features of her creative approach to transformation of a visualized landscape into an expressive picture. Her love for nature touches upon other aspects as well. She draws audience’s attention to the process of painting’s creation. It is up to the viewer to look beyond the colored landscape, but the artist invites to discover her "internalized" vision of landscapes she is so enthusiastic about and which she willingly and creatively sublimates. The obvious visible object is transformed by the artist into a world of her own. The "obvious" and the "intellectually-emotionally" treated piece of art, influenced by the esoteric sub-conscience. Such juxtaposion of intertwined, differently acting factors is a revealing feature of creative processes. The color is not just a structural pillar of Katsiaryna Sumarava's talents. It is a reflection of her intellectualized experience. 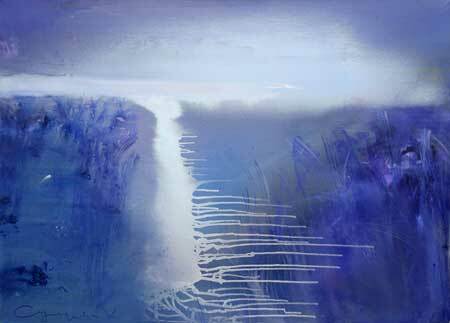 A generalized landscape multiplied by an intensive blue, generates a dimensional depth. Being present in many of her works it works on subconscious level. The choice of another color platform excites her as if that leads to an opening up of a new path to a new sovereign territory. In order to bring into the view as many colors as possible the artist gives her work additional charge of lyrical softness and an airy subtlety. Katsiaryna Sumarava was born in Minsk, Belarus in 1979. In 2004 shegraduated from the Belarusian Art Academy. She also took an in-depth study course at the Academy of Fine Arts, Carrara, Italy. 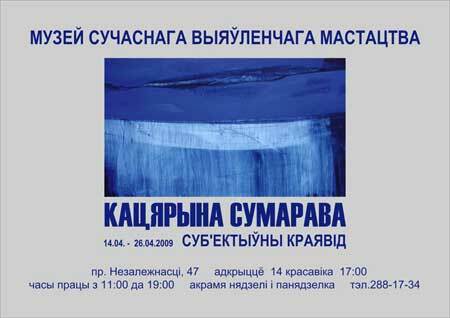 Since 2007 Katsiaryna is a member of the Belarusian Artists' Union. Her works are at numerous private collections in Belarus, Lithuania, Poland, the Ukraine, Iran, Slovenia, the Netherlands, Japan, Germany and Italy.